Our sensory experiences over a range of different timescales shape our perception of the environment. Two particularly striking short-term forms of plasticity with manifestly different time courses and perceptual consequences are those caused by visual adaptation and perceptual learning. Although conventionally treated as distinct forms of experience-dependent plasticity, their neural mechanisms and perceptual consequences have become increasingly blurred, raising the possibility that they might interact. To optimize our chances of finding a functionally meaningful interaction between learning and adaptation, we examined in humans the perceptual consequences of learning a fine discrimination task while adapting the neurons that carry most information for performing this task. Learning improved discriminative accuracy to a level that ultimately surpassed that in an unadapted state. This remarkable improvement came at a price: adapting directions that before learning had little effect elevated discrimination thresholds afterward. The improvements in discriminative accuracy grew quickly and surpassed unadapted levels within the first few training sessions, whereas the deterioration in discriminative accuracy had a different time course. This learned reconfiguration of adapted discriminative accuracy occurred without a concomitant change to the characteristic perceptual biases induced by adaptation, suggesting that the system was still in an adapted state. Our results point to a functionally meaningful push–pull interaction between learning and adaptation in which a gain in sensitivity in one adapted state is balanced by a loss of sensitivity in other adapted states. Our sensory experiences, ranging from early development to recent sensory input, shape our perception of the environment. Two intensively studied forms of short-term plasticity are those caused by visual adaptation (Kohn, 2007; Wark et al., 2007) and perceptual learning (Fahle and Poggio, 2002; Fine and Jacobs, 2002). Adaptation usually produces a temporary loss of sensitivity and concomitant perceptual aftereffect after passive exposure to a stimulus (Gibson, 1933; Blakemore and Campbell, 1969; Levinson and Sekuler, 1976), whereas learning typically produces long-lasting enhancements of sensitivity with no change in perceptual bias after actively performing a task (Ramachandran and Braddick, 1973; McKee and Westheimer, 1978; Karni and Sagi, 1993). With manifestly different perceptual consequences and time courses, visual adaptation and perceptual learning are conventionally treated as independent forms of plasticity with different mechanisms and functional benefits. However, many of these distinctions are rather blurred (Webster, 2011). For example, adaptation, like learning, can enhance sensitivity (De Valois, 1977; Clifford et al., 2001; Kwon et al., 2009; McDermott et al., 2010) and persist over long timescales (Jones and Holding, 1975; Kwon et al., 2009; Zhang et al., 2009), and learning, like adaptation, can both impair visual performance (Mednick et al., 2003) and alter visual appearance (Haijiang et al., 2006). It is therefore difficult to distinguish adaptation from learning on purely perceptual grounds. Moreover, both act on the same or overlapping neural circuits in visual cortex, although the neural effects of adaptation are much more robust (Maffei et al., 1973; Zohary et al., 1994; Muller et al., 1999; Dragoi et al., 2000; Schoups et al., 2001; Teich and Qian, 2003; Kohn and Movshon, 2004; Yang and Maunsell, 2004; Raiguel et al., 2006; Gutnisky and Dragoi, 2008; Gu et al., 2011). The “readout” of visual signals also has a role to play (Dosher and Lu, 1998; Chowdhury and DeAngelis, 2008; Law and Gold, 2008; Seriès et al., 2009), and its “awareness” of plastic changes in visual cortex is an important determinant of perceptual bias (Schwartz et al., 2007; Seriès et al., 2009). That both forms of sensory plasticity can have similar perceptual effects and are mediated by overlapping circuitry suggests that they might interact. Although there is a long history of research examining adaptation and learning in isolation, researchers have only begun asking whether there is a functional relationship between these forms of plasticity (Tanaka et al., 2007; Yehezkel et al., 2010). We optimized our chances of finding such an interaction by asking human subjects to learn a discrimination task while in an adapted state that impaired discriminative accuracy. This is different from most perceptual learning studies that typically investigate the rules governing transfer of learning between different tasks (Ramachandran and Braddick, 1973; Fiorentini and Berardi, 1980; Fahle, 2005; Webb et al., 2007). We found that practicing a discrimination task while adapted turned the cost of adaptation into a benefit for discriminative accuracy. This remarkable improvement came at a price: adapted states that before learning had little effect induced a significant cost for discriminative accuracy afterward. Eighty-one human subjects, 18–39 years old, with normal or corrected-to-normal vision participated in the study after giving informed consent. Thirty-two were male and 49 were female. All were naive to the purposes of the experiments. The study consisted of three separate experiments. In the first experiment, 20 subjects learned a fine discrimination task while in an adapted state. In the second experiment, 55 different subjects were randomly assigned to learn on the same task while adapted but for different numbers of training sessions. The numbers of subjects who trained for 2, 4, 6, or 8 days were, respectively, 16, 10, 10, and 19. In the third experiment, we measured the duration of motion aftereffects caused by adapting to the directions used in the first experiment before and after learning in an adapted state in six different subjects. Stimuli were random dot patterns generated on either a personal computer or Macintosh G5 computer running custom software written in Python (Peirce, 2007). Stimuli were displayed on an IIyama Vision Master Pro 514 or CRT monitor with a resolution of 1280 × 1024 pixels, with update rate of 75 Hz at a viewing distance of 76.3 cm. Each frame in a motion sequence consisted of 300 dots (0.05 cd/m2 luminance) displayed within a circular window (6° diameter) centered 6° to the right of a fixation point (0.05 cd/m2 luminance). Dot density and diameter were 5 dots/deg2 and 0.1°, respectively. Background luminance was 25 cd/m2. On the first frame in a motion sequence, dots were randomly positioned in the circular window and were displaced in a specified direction at 5°/s. Dots that fell outside were wrapped to the opposite side of the window. Subjects judged whether a field of dots was moving in a direction clockwise or counterclockwise from upward. The direction discrimination threshold was determined using a staircase procedure. Before and after training, we measured the baseline discrimination threshold and change in this estimate caused by adapting to motion in an upward direction or two directions offset symmetrically (±10 to ±50°) from upward. Two directions were used for the adaptation to balance distortions in perceived direction caused by adapting to a single direction offset from upward (Levinson and Sekuler, 1976). Adapting directions were presented initially for 30 s with 4 s top-ups between each trial. Test stimuli were presented for 0.5 s, separated by a 0.5 s interval containing a fixation cross on a uniform luminance background. Subjects repeatedly practiced the discrimination task for 8–10 sessions while adapting to directions that before training caused the largest elevation in discrimination thresholds in most subjects. A one-down, one-up staircase varied the direction of test stimuli until the first incorrect response, upon which the staircase switched to a three-down, one-up. Each staircase terminated after 16 reversals, and discrimination thresholds were calculated as the geometric mean of the last six reversals. Before and after training, we measured unadapted (four staircases) and adapted (one staircase for each adapting condition) direction discrimination thresholds in a session lasting ∼2 h. The order of testing was randomized for each subject, and 10 min breaks were taken after each adapting run to avoid cross-contamination between different adapted states. Training consisted of 8–10 sessions conducted on separate days. In each session, we took three estimates of adapted direction discrimination performance. Training sessions lasted ∼40 min. In the time course experiment, exactly the same procedure was used with the exception that we varied the length of training in independent groups of subjects. The timing and procedure were exactly the same as that for fine discrimination with the following exception. The test stimulus contained a single frame of static dots giving rise to the illusory perception of downward motion (motion aftereffect). Subjects indicated via a key press when the motion aftereffect had ended, thus quantifying its total duration rather than strength at any given moment. The mean duration of the aftereffect for each adapting direction was calculated across 30 trials. We chose to measure duration rather than the strength of the motion aftereffect because nulling techniques (typically used to measure strength of the aftereffect) have several undesirable characteristics with random dot patterns (Castet et al., 2002). Moreover, duration is the most commonly used measure of the motion aftereffect and related to nulling in the sense that it provides similar information on the underlying mechanisms (van de Grind et al., 2003). Humans optimize their performance on a sensory task by exploiting the neural signals that convey the most accurate information for performing that task. The degree to which neural signals carry information for performing different tasks can be formalized in terms of Fisher information, which provides a bound on the precision of sensory estimates (Seung and Sompolinsky, 1993; Pouget et al., 2001; Butts and Goldman, 2006; Seriès et al., 2009). Figure 1 illustrates the information carried by a homogeneous population of neurons tasked with discriminating small deviations in motion direction from upward— the psychophysical task used here. Assuming that responses are uncorrelated and Poisson distributed, the most informative signals for performing a fine discrimination task are carried by neurons tuned away from the discrimination boundary because small deviations from upward produce the largest change in their firing rate, whereas neurons tuned to upward carry the least amount of information for performing this task because small deviations from upward produce little or no change in their firing rate. Consistent with the theoretical notion that Fisher information places a lower bound on the information decoded from a neural population, perturbing the responses of so-called “off-axis” neurons via short-term adaptation produces the largest elevation in discrimination thresholds (Regan and Beverley, 1983, 1985; Phinney et al., 1997; Clifford et al., 2001; Hol and Treue, 2001). Moreover, selectively altering the responses of off-axis neurons through repeated practice on a fine discrimination task enhances discriminative accuracy (Schoups et al., 2001; Raiguel et al., 2006). Therefore, to optimize our chances of finding a functionally meaningful interaction between learning and adaptation, we examined the perceptual consequences of learning a fine discrimination task while adapting these putative off-axis neurons (i.e., the ones carrying the most information for performing this task). Fisher information carried by a homogeneous population of neurons performing a fine discrimination task. a, Tuning functions of direction-selective neurons responding to upward motion (black) and directions offset symmetrically ±20° (dark gray) and ±40° (light gray) from upward. b, Fisher information for performing this task is highest for neurons tuned to directions ±20° from upward (dark gray circles) because small deviations from upward produce the largest differential firing rate. Neurons tuned to upward (black circle) and directions ±40° from upward (light gray circles) convey no or very little information because their differential firing rates to small deviations from upward are zero or negligible, respectively. Vertical dashed line indicates the boundary around which neurons discriminate whether a stimulus was moving in a direction clockwise (CW) or counterclockwise (CCW) from upward. Fisher information was calculated as follows: FI = f′i(θ)2/ni(θ), where f′i(θ) is the differential firing rate to small deviations from upward, and ni(θ) is the variance of the Poisson distributed response. Figure 2 shows examples of the visual stimuli (Fig. 2a) and structure of the adaptation and training procedures (Fig. 2b). Subjects viewed a field of moving dots on a visual display and reported whether the direction of motion was clockwise or counterclockwise of upward. Before and after training in an adapted state, we measured the baseline discrimination threshold and change in this estimate caused by adapting to motion in an upward direction (0°) or two directions offset symmetrically (±10 to ±50 °) from upward. During training, the same group of subjects repeatedly practiced the direction discrimination task while adapted to the directions (±20° from upward) that were, on average, most effective at elevating discrimination thresholds before the training phase. Perceptual adaptation and training procedures. a, Adaptation procedure. Subjects judged whether a field of dots was moving in a direction clockwise or counterclockwise from upward. The change in discrimination performance caused by adapting to motion in an upward direction (0°) or two directions offset symmetrically (±10 to ±50°) from upward was measured. Adapting directions were presented initially for 30 s with 4 s top-ups between each trial. Test stimuli were presented for 0.5 s, separated by a 0.5 s interval containing a fixation cross on a uniform luminance background. b, Training procedure. Before and after training, we measured the change in baseline direction discrimination performance caused by adapting to motion in an upward direction (0°) or two directions offset symmetrically (±10 to ±50°) from upward. During training, the same group of subjects repeatedly practiced the direction discrimination task while adapted to directions ±20° from upward. Before learning and in the absence of adaptation, direction discrimination thresholds were, on average, 2.15° ± 0.04° (mean ± SEM). Adapting directions offset ±20° from upward were most effective at degrading discrimination performance in most (16 of 20) subjects, causing an elevation in direction discrimination thresholds in all subjects (Fig. 3b, white symbols all above unity line; mean of 4.07 ± 0.09). In four subjects, adapting directions ±30° from upward produced marginally larger threshold elevations. This cost to discriminative accuracy confirms previous work showing that adaptation exerts its most potent effects on discrimination performance when acting on neurons tuned away from the discrimination boundary (Regan and Beverley, 1983, 1985; Phinney et al., 1997; Clifford et al., 2001; Hol and Treue, 2001). Repeated practice of the fine discrimination task while adapted to directions offset ±20° from upward gradually improved an individual's discrimination performance over the course of training (Fig. 3a). In contrast, after training in an adapted state, there was little or no change to unadapted discrimination performance (Fig. 3a, filled triangle). Remarkably, this resulted in discrimination thresholds in an adapted state that surpassed unadapted performance levels. Put simply, learning in an adapted state turned the cost of adaptation into a benefit. The same pattern was seen for all subjects: repeated practice of direction discrimination while adapted led to a fourfold improvement in performance, on average, that at the end of training surpassed or was, in a minority of subjects, equivalent to unadapted performance (Fig. 3b, black symbols below or on unity line). We did not find any evidence that this improvement was related to whether the adapter produced the strongest threshold elevation. Learning turns the cost of adaptation into a benefit for discriminative accuracy. a, Learning curve from an individual subject who repeatedly practiced the discrimination task for nine sessions while adapting to directions (±20°) that before training caused the largest elevation in discrimination thresholds. Upward arrowheads show unadapted discrimination thresholds before (white) and after (black) training, respectively. Circles show adapted discrimination thresholds before (white), during (gray), and after (black) training. Error bars indicate 1 SEM. b, Symbols show direction discrimination thresholds of individual subjects in an unadapted state plotted as a function of those obtained in an adapted state (±20° adapter) before (white) and after (black) learning. Marginal histogram shows the ratio of adapted to unadapted direction discrimination thresholds. 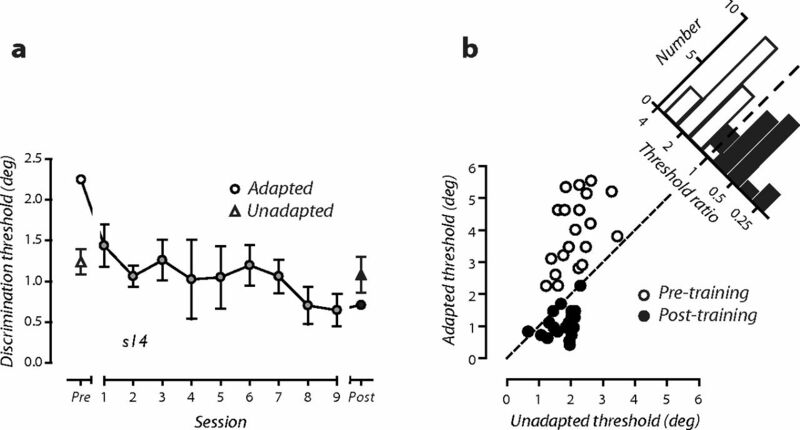 Black and white represent the relationship between unadapted and adapted discrimination performance before and after learning in an adapted state, respectively. Figure 4 compares the consequences that learning in this adapted state had on the effectiveness of trained and untrained adapting directions. Data are expressed as a ratio of adapted and unadapted discrimination thresholds, in which numbers greater than or less than one indicate a cost or benefit of adaptation, respectively. For each adapting condition, threshold ratios are plotted as group geometric means before and after training (Fig. 4a) and for individual subjects before training as a function of those obtained afterward (Fig. 4b). Before training, we found the characteristic pattern of adapted discriminative accuracy (Fig. 4a, white circles; Phinney et al., 1997; Hol and Treue, 2001). Reinforcing the point made above, training while adapted to directions ±20° from upward switched the cost before learning (Fig. 4a, 1.82, 0.24–0.21, geometric mean, ±95% CIs) to a benefit afterward (Fig. 4a, 0.58, 0.14–0.11) in all subjects (Fig. 4b, top right). However, this striking improvement in trained adapted discrimination performance came at a price: untrained adapting directions that before learning had either minimal or beneficial effects induced a significant elevation in discrimination thresholds after learning (Fig. 4a, black circles). For example, adaptation to upward (0°) motion produced a benefit before learning (Fig. 4a, 0.68, 0.15–0.12) but a substantial cost afterward (1.2, 0.29–0.24) in most subjects (Fig. 4b, top left). We did not find any statistically significant relationships across subjects between the threshold elevations induced by adapters at ±20° before learning and the amount of benefit or cost for discriminative accuracy afterward. Learning reconfigures adapted discriminative accuracy. a, White circles show the mean change in direction discrimination thresholds caused by adaptation to visual motion in an upward direction or directions offset symmetrically from upward. Black circles show the same function after the same group of subjects had repeatedly practiced the direction discrimination task while adapted to directions offset ±20° from upward. Symbols are the geometric mean discrimination thresholds of 20 subjects; error bars are ±95% CIs estimated from the intersubject variability of log-transformed threshold ratios. b, In each panel, the ratio of individual subjects' adapted and unadapted discrimination thresholds before training are plotted as a function of those obtained after training. Panels correspond to different adapting directions. A potential limitation of using a staircase procedure is that estimates of discriminative accuracy can be distorted by biased response patterns (e.g., a general tendency to responding clockwise), making it difficult to distinguish between a change in bias and a genuine change in discriminability. To control for this possibility, we repeated the experiment in a small sample of new subjects (n = 5) using upward (0°) and ±20° from upward adapters. We used the method of constant stimuli to derive estimates of discriminability from the slope of the psychometric function and perceptual bias from the point of subjective equality. Figure 5a shows psychometric functions for one subject from the two adapting conditions before (open circles) and after training (filled circles). After training while adapted to directions ±20° from upward, the slope of the psychometric function is evidently steeper (i.e., a lower discrimination threshold) without any concomitant horizontal shift (i.e., little or no change in the point of subjective quality). To determine the extent to which bias contaminated our estimates of discriminability, we also recoded subjects' clockwise and counterclockwise judgments as percentage of correct responses. Figure 5b shows the ratios of each individual's adapted and unadapted thresholds estimated from the slope of the psychometric function (circles) and the deviation from upward yielding 75% correct performance (stars). We found the same pattern of results as the original experiment (compare Figs. 4b, 5b), suggesting that our findings are robust across different methods of threshold estimation. Learned reconfiguration of adapted discriminative accuracy is robust across different methods of threshold estimation. a, Psychometric functions for one subject obtained in the upward (0°) and ±20° from upward adapting conditions before (open circles) and after (filled circles) training. b, Ratio of individual subjects' adapted and unadapted discrimination thresholds before training are plotted as a function of those obtained after training. Thresholds were estimated from either the slope of the psychometric function (circles) or the deviation from upward yielding 75% correct performance (stars). To characterize the relative time course of these opposing changes in discrimination performance, we asked additional groups of subjects to practice the same fine discrimination task while adapted to directions offset ±20° from upward for different training periods. Before and after training, we measured their baseline discrimination performance and the change in this estimate caused by two of the original adapting configurations: upward (0°) motion and directions offset ±20° from upward. The learned reconfiguration of motion adaptation was most dramatic in these adapting conditions, altering the effects of adaptation in opposing directions. We varied the length of the training period (two, four, six, or eight sessions) over which subjects repeatedly practiced the task while in an adapted state. For each training period, threshold ratios (calculated as above) are plotted for individual subjects before training as a function of those obtained afterward (Fig. 6a) and on a group basis (Fig. 6b). The cost of adaptation at ±20° before training disappeared after relatively few training sessions and had switched by day 8 to a benefit similar in magnitude to that found in the original study (Fig. 6a, bottom row, b, right). Whereas the reversal of the benefit induced by the 0° adapter had a slightly different time course, the threshold elevation only became apparent with additional training but by day 8 had almost reached the level found in the original study (Fig. 6a, top row, b, left). Time courses of the opposing outcomes of learning in an adapted state. a, Panels show individual threshold ratios before training plotted as a function of those obtained after training (as in Fig. 4b). Columns show groups that trained for different numbers of days. Rows show different adapting conditions. b, Bars show geometric mean threshold ratios for groups that trained for different numbers of days. White and black bars show these data before and after training. Left and right panels correspond to different adapting conditions. Error bars are ± 95% CIs, calculated as in Figure 4a. One possible explanation for the reconfiguration of discriminative accuracy is that learning had changed the susceptibility of the visual system to different forms of adaptation (i.e., reconfigured the characteristic perceptual biases induced by motion adaptation) (Levinson and Sekuler, 1976; Mather et al., 1998). Learning may have reduced the perceptual biases induced by the trained adapting stimulus while simultaneously increasing perceptual biases to other adapting directions. To test this possibility, we conducted an additional experiment exploiting the characteristics of a well-known visual aftereffect. The motion aftereffect (Addams, 1834) is a robust measure of perceptual bias in which prolonged exposure to a moving stimulus causes a subsequently presented stationary stimulus to appear to move in the opposite direction—a phenomenon thought to arise from adaptation of direction-selective neurons in visual cortex (Mather et al., 1998). Before and after learning, we measured the duration of the motion aftereffects caused by adapting to the directions used in the original discrimination learning experiment. We reasoned that, if learning alters the degree of adaptation induced by different motion directions, the magnitude of motion aftereffects should be modulated in a similar manner to discrimination thresholds. Contrary to this prediction, the durations of the motion aftereffects were equivalent before and after learning in the six subjects we tested (Fig. 7). 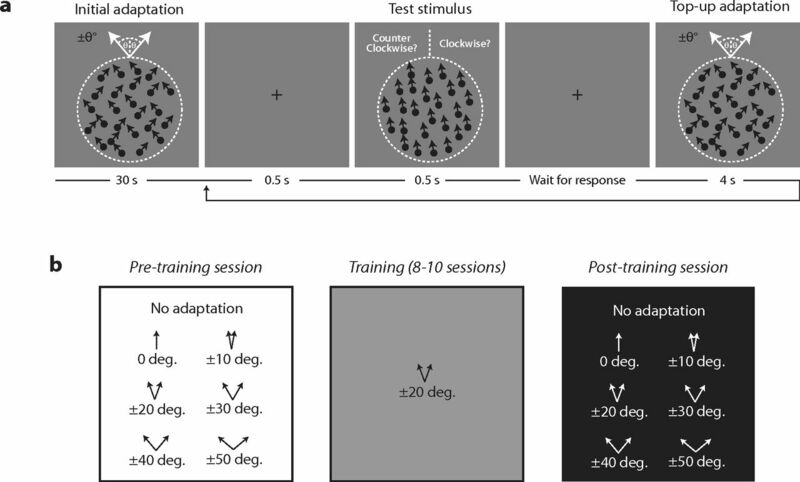 This suggests that, rather than simply altering the susceptibility to adaptation, learning optimized discriminative accuracy in the trained adapted state while leaving adaptation-induced perceptual biases unaffected. Learning while adapted does not alter adaptation-induced perceptual biases. a, White circles show the mean duration of motion aftereffects (MAE) caused by adaptation to visual motion in an upward direction or directions offset symmetrically from upward. Black circles show the same function after the same group of subjects had repeatedly practiced the direction discrimination task while adapted to directions offset ±20° from upward. Symbols are the arithmetic mean of six subjects. b, Each panel shows the mean duration of motion aftereffects for individual subjects before training and are plotted as a function of those obtained after training. Panels correspond to different adapting directions. Error bars are ±95% CIs calculated from either the intersubject variability in mean duration estimates (a) or trial-by-trial variability in individual duration estimates (b). We have shown that learning in an adapted state reconfigures the effects of motion adaptation on direction discrimination performance. Repeated practice in an adapted state produced an improvement in discrimination performance that ultimately was better than that obtained in an unadapted state. This remarkable reversal in the effects of adaptation in the trained adapted state had dramatic consequences for discrimination performance in untrained adapted states. Adapted states that before learning were relatively ineffectual induced significant costs for discriminative accuracy afterward. This learned reconfiguration of adapted discriminative accuracy occurred without an accompanying change to perceptual bias. Before we can infer a genuine interaction between learning and adaptation, we first need to rule out the possibility that this pattern of results can be explained by established properties of either form of plasticity alone. Our results differ from the perceptual consequences of adaptation in three important ways. First, unlike the loss of sensitivity and concomitant perceptual aftereffect typically brought about by adaptation (Addams, 1834; Gibson, 1933; Blakemore and Campbell, 1969; Levinson and Sekuler, 1976), we have revealed a reconfiguration of sensitivity without any accompanying change to perceptual bias. Second, unlike the ephemeral nature of short-term adaptation effects and their gradual decay after an inducing stimulus is withdrawn (for review, see Kohn, 2007; Wark et al., 2007; Webster, 2011), we found minimal “slippage” to the sensitivity changes between training sessions (the learning curve in Fig. 3a illustrates how improvements in adapted discriminative accuracy are retained between training sessions). Third, unlike some forms of adaptation that enhance perceptual sensitivity (De Valois, 1977; Clifford et al., 2001; Kwon et al., 2009; Zhang et al., 2009; McDermott et al., 2010) and persist over long timescales (Jones and Holding, 1975; Kwon et al., 2009; Zhang et al., 2009), we have revealed improvement and deteriorations in sensitivity that appeared to emerge at slightly different timescales. The long-lasting changes to perceptual sensitivity without a concomitant effect on perceptual bias are reminiscent of conventional perceptual learning (for review, see Fahle and Poggio, 2002; Fine and Jacobs, 2002). A crucial difference however, is that the learned benefits for sensitivity reported here were tightly coupled to the trained adapted state rather than the perceptual task (which was the same throughout the training procedure) and were inversely related to the costs for sensitivity in untrained adapted states. These effects suggest a functional interaction between learning and adaptation in which a gain in sensitivity in one adapted state is balanced by a loss of sensitivity in other adapted states. We are aware of two other empirical studies that have examined the relationship between perceptual learning and visual adaptation, both of which considered the effects of learning while adapted to optical distortions (Tanaka et al., 2007; Yehezkel et al., 2010). In one (Yehezkel et al., 2010), repeated exposure to astigmatic blur increased resistance to blur-induced biases, an effect that was maintained after the optical lens was removed. The authors interpreted this as “learning” but did not examine the concomitant consequences for perceptual sensitivity, leaving open the possibility that they were simply describing long-term blur adaptation. In the other study (Tanaka et al., 2007), learned improvements in contrast sensitivity while wearing prism glasses transferred across the vertical meridian. It remains unresolved, however, whether prism adaptation is a purely visual phenomenon (Stratton, 1897; Kohler, 1964) or also involves the motor (Day and Singer, 1967), sensorimotor (Held and Freeman, 1963), or proprioceptive (Harris, 1963) systems. Perhaps the critical point of difference between these studies and our work is that neither considered the perceptual consequences of learning in untrained adapted states and so did not have the opportunity to reveal that learning reconfigures adapted discriminative accuracy. Our initial assumption was that the effects of visual adaptation on discriminative accuracy mirror the pattern of information carried by neurons for performing fine discriminations (Fig. 1). If this logic holds after learning, the information for performing fine discriminations should mirror the reconfiguration of adapted discriminative accuracy. For example, neurons tuned to upward motion that before learning carried no information for performing fine discriminations around upward, after learning, would carry significant amounts of information for performing this task. That is, neurons tuned to upward would not only respond most to upward but would also have large differential responses to small deviations from upward. Unless we assume huge shifts in neuronal tuning preferences for which we could not find any physiological evidence, it is seems unlikely that learning reconfigured the underlying information in this manner. We note, however, that our estimates of Fisher information assume a homogenous population of neurons whose responses are uncorrelated and Poisson distributed. We therefore cannot rule out the possibility that learning reconfigured the distribution and/or correlation structure of response variability—factors that can have substantial effects on the information encoded by neuronal populations (Shadlen and Newsome, 1998; Abbott and Dayan, 1999; Nirenberg and Latham, 2003; Averbeck et al., 2006). The effects of adaptation on neuronal tuning in visual cortex are diverse (Maffei et al., 1973; Saul and Cynader, 1989; Muller et al., 1999; Dragoi et al., 2000; Priebe and Lisberger, 2002; Van Wezel and Britten, 2002; Kohn and Movshon, 2003, 2004; Jin et al., 2005) and vary across different cortical areas (Kohn and Movshon, 2004). Perhaps the most established effect of adaptation is to reduce neuronal responsiveness to the adapting stimulus (Clifford, 2002; Van Wezel and Britten, 2002; Kohn, 2007). Modeling adaptation as a reduction in neuronal gain can accommodate many of the perceptual consequences of adaptation (Clifford et al., 2000; Seriès et al., 2009), including the changes to discriminability that we (Fig. 4a, white symbols) and others (Regan and Beverley, 1983, 1985; Phinney et al., 1997; Clifford et al., 2001; Hol and Treue, 2001) have found in the absence of learning. Given that learning reversed the effects of adaptation on discriminability in this study, it is tempting to infer that adaptation had switched from a reduction to an increase in neuronal gain. Although this would reconfigure adapted discriminability in a manner similar to what we have found after learning, it would also predict motion aftereffects moving in an upward direction—opposite to that reported by subjects. It therefore seems unlikely that the established effects of adaptation on neuronal tuning could reproduce the dramatic reconfiguration of adapted discriminative accuracy after learning. Perceptual learning can also alter the response properties of neurons in visual cortex (Schoups et al., 2001; Yang and Maunsell, 2004; Raiguel et al., 2006), although the effects are less robust than those observed after adaptation (Ghose et al., 2002). For example, repeated practice can enhance discrimination performance by selectively altering the tuning of neurons at early (Schoups et al., 2001) and intermediate (Raiguel et al., 2006) levels of the visual cortical hierarchy. In principle, learning could be operating in a similar manner here, selectively altering tuning or boosting gain of neurons tuned to the trained adapted directions. However, this would uniformly improve discriminative accuracy in all adapting conditions, because these off-axis neurons have the largest differential response to small deviations from upward, regardless of the adapted state. Indeed, any changes to the response properties of the encoding neurons, which arose independently of their adapted state, would produce the same uniform improvement in discrimination performance. Perceptual learning can also arise from the way in which signals in visual cortex are read out to form decisions (Dosher and Lu, 1998; Chowdhury and DeAngelis, 2008; Law and Gold, 2008). For example, placing greater weight on the most sensitive neurons can improve task performance, particularly in situations in which task-irrelevant noise in the stimulus produces broad activity within the neuronal population (Law and Gold, 2008). In the absence of stimulus noise, the potential for improvements are more modest. Particularly relevant here are the findings of Seriès et al. (2009), who demonstrated that adaptation-induced costs in basic discriminative accuracy cannot be overcome by optimizing the readout for the new adapted state. Instead, threshold improvements are limited by a lower bound determined by Fisher information (Seriès et al., 2009), making it unlikely that a change in the readout alone can explain the magnitude of learned improvements we observe, let alone the accompanying costs. Whatever neural mechanism mediates the interaction between learning and adaptation is likely to involve some form of push-pull process, in which a gain in sensitivity in one adapted state is balanced by a loss of sensitivity in other adapted states. That learning can completely reconfigure the effects of adaptation has important implications for the study of both forms of plasticity. On the one hand, it suggests that the behavioral signatures of adaptation are not fixed and complicates the sort of inferences we can make about the neural mechanisms underlying adaptation-induced sensitivity changes. On the other, it raises the intriguing possibility that the adapted state of the system is as important as the nature of the task itself during learning. Future research may benefit from considering the effects of learning and adaptation within a common theoretical framework rather than studying them in isolation. This work was funded by a Wellcome Trust Research Career Development Fellowship (B.S.W.). We thank Gaelle Coullon for help with data collection and Greg DeAngelis, David Moore, and Mehrdad Jazayeri for critical discussion and comments on previous versions of this manuscript. (1834) An account of a peculiar optical phenomenon seen after having looked at a moving body. Lond Edinb Philos Mag J Sci 5:373–374. (1969) On the existence of neurones in the human visual system selectively sensitive to the orientation and size of retinal images. J Physiol 203:237–260. 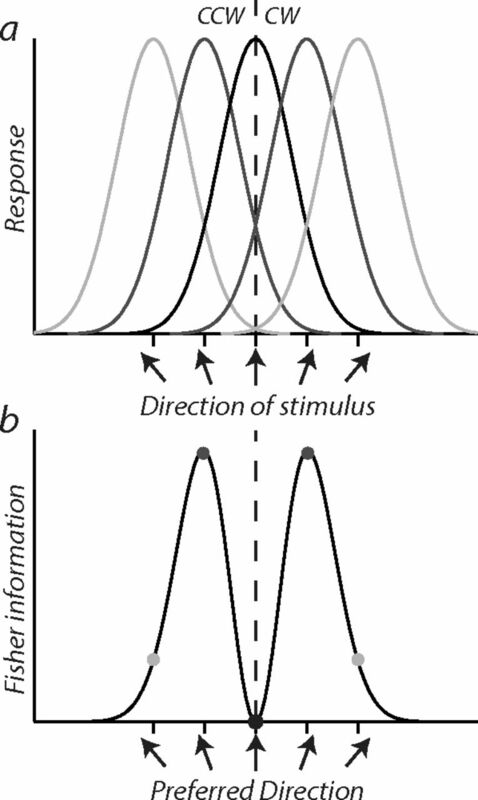 (2006) Tuning curves, neuronal variability, and sensory coding. PLoS Biol 4:e92. (2002) Nulling the motion aftereffect with dynamic random-dot stimuli: limitations and implications. J Vis 2:302–311. (2002) Perceptual adaptation: motion parallels orientation. Trends Cogn Sci 6:136–143. (2000) A functional angle on some after-effects in cortical vision. Proc Biol Sci 267:1705–1710. (2001) Orthogonal adaptation improves orientation discrimination. Vision Res 41:151–159. (1967) Sensory adaptation and behavioral compensation with spatially transformed vision and hearing. Psychol Bull 67:307–322. (1977) Spatial frequency adaptation can enhance contrast sensitivity. Vision Res 17:1057–1065. (1998) Perceptual learning reflects external noise filtering and internal noise reduction through channel reweighting. Proc Natl Acad Sci U S A 95:13988–13993. (2000) Adaptation-induced plasticity of orientation tuning in adult visual cortex. Neuron 28:287–298. (2005) Perceptual learning: specificity versus generalization. Curr Opin Neurobiol 15:154–160. (2002) Perceptual learning (Massachusetts Institute of Technology, Cambridge, MA). (2002) Comparing perceptual learning across tasks: a review. J Vis 2:190–203. (1980) Perceptual learning specific for orientation and spatial frequency. Nature 287:43–44. (2002) Physiological correlates of perceptual learning in monkey V1 and V2. J Neurophysiol 87:1867–1888. (1933) Adaptation, after-effect and contrast in the perception of curved lines. J Exp Psychol 16:1–31. (2011) Perceptual learning reduces interneuronal correlations in macaque visual cortex. Neuron 71:750–761. (2006) Demonstration of cue recruitment: change in visual appearance by means of Pavlovian conditioning. Proc Natl Acad Sci U S A 103:483–488. (1963) Adaptation to displaced vision: visual, motor, or proprioceptive change? Science 140:182–183. (1963) Plasticity in human sensorimotor control. Science 142:455–462. (2001) Different populations of neurons contribute to the detection and discrimination of visual motion. Vision Res 41:685–689. (2005) Tilt aftereffect and adaptation-induced changes in orientation tuning in visual cortex. J Neurophysiol 94:4038–4050. (1975) Extremely long-term persistence of the McCollough effect. J Exp Psychol Hum Percept Perform 1:323–327. (1993) The time course of learning a visual skill. Nature 365:250–252. (1964) The formation and transformation of the perceptual world (International Universities, New York). (2007) Visual adaptation: physiology, mechanisms, and functional benefits. J Neurophysiol 97:3155–3164. (2003) Neuronal adaptation to visual motion in area MT of the macaque. Neuron 39:681–691. (2004) Adaptation changes the direction tuning of macaque MT neurons. Nat Neurosci 7:764–772. (2009) Adaptive changes in visual cortex following prolonged contrast reduction. J Vis 9:20, 21–16. (2008) Neural correlates of perceptual learning in a sensory-motor, but not a sensory, cortical area. Nat Neurosci 11:505–513. (1976) Adaptation alters perceived direction of motion. Vision Res 16:779–781. (1973) Neural correlate of perceptual adaptation to gratings. Science 182:1036–1038. (1998) The motion aftereffect: a modern perspective (Massachusetts Institute of Technology, Cambridge MA). (2010) Adaptation and visual salience. J Vis 10:17. (1978) Improvement in vernier acuity with practice. Percept Psychophys 24:258–262. (2003) Sleep-dependent learning: a nap is as good as a night. Nat Neurosci 6:697–698. (2003) Decoding neuronal spike trains: how important are correlations? Proc Natl Acad Sci U S A 100:7348–7353. (2007) Psychopy: psychophysics software in Python. J Neurosci Methods 162:8–13. (1997) Direction-selective coding of stereoscopic (cyclopean) motion. Vision Res 37:865–869. (2001) in Visual attention and cortical circuits, The relevance of Fisher information for theories of cortical computation and attention, eds Braun J, Koch C, Davis JL (Massachusetts Institute of Technology, Cambridge, MA). (2002) Constraints on the source of short-term motion adaptation in macaque area MT. II. Tuning of neural circuit mechanisms. J Neurophysiol 88:370–382. (2006) Learning to see the difference specifically alters the most informative V4 neurons. J Neurosci 26:6589–6602. (1973) Orientation-specific learning in stereopsis. Perception 2:371–376. (1983) Spatial-frequency discrimination and detection: comparison of postadaptation thresholds. J Opt Soc Am 73:1684–1690. (1985) Postadaptation orientation discrimination. J Opt Soc Am A 2:147–155. (1989) Adaptation in single units in visual cortex: the tuning of aftereffects in the spatial domain. Vis Neurosci 2:593–607. (2001) Practising orientation identification improves orientation coding in V1 neurons. Nature 412:549–553. (2007) Space and time in visual context. Nat Rev Neurosci 8:522–535. (2009) Is the homunculus aware of sensory adaptation? Neural Comput 21:3271–3304. (1993) Simple models for reading neuronal population codes. Proc Natl Acad Sci U S A 90:10749–10753. (1998) The variable discharge of cortical neurons: Implications for connectivity, computation and information coding. J Neurosci 18:3870–3896. (1897) Vision without inversion of the retinal image. Psychol Rev 4:341, 360, 463–481. (2007) Mirror symmetrical transfer of perceptual learning by prism adaptation. Vision Res 47:1350–1361. (2003) Learning and adaptation in a recurrent model of V1 orientation selectivity. J Neurophysiol 89:2086–2100. (2003) A gain-control model relating nulling results to the duration of dynamic motion aftereffects. Vision Res 43:117–133. (2002) Motion adaptation in area MT. J Neurophysiol 88:3469–3476. (2007) Sensory adaptation. Curr Opin Neurobiol 17:423–429. (2007) Perceptual learning in the absence of task or stimulus specificity. PLoS One 2:e1323. (2011) Adaptation and visual coding. J Vis 11:1–23. (2004) The effect of perceptual learning on neuronal responses in monkey visual area V4. J Neurosci 24:1617–1626. (2010) Learning to adapt: dynamics of readaptation to geometrical distortions. Vision Res 50:1550–1558. (2009) Effects of orientation-specific visual deprivation induced with altered reality. Curr Biol 19:1956–1960. (1994) Neuronal plasticity that underlies improvement in perceptual performance. Science 263:1289–1292.